It seems that I’ve admired Fiesta Dinnerware forever, but it wasn’t until just a couple years ago that we ditched our everyday cheap white dishes and invested in our own set of Fiesta, in a mixed color scheme of scarlet, turquoise, lemongrass, and sunflower. I am so happy with the shapes, sizes, colors, functionality, and quality of every piece of Fiesta that we own, and it’s so much fun adding new pieces to our collection. So when Fiesta contacted me after seeing some of their dinnerware in my photographs, asking if I’d like to receive some pieces in their newest color “poppy” (Fiesta introduces a new color each year), I was excited to check it out. That pretty bright reddish-orange color would be awesome for fall! Be sure to get the recipe for my Cheesy Zucchini Noodles Bake with Roasted Corn and Red Pepper that I featured in my own Fiesta Square Baker. My whole family loves it! And please check out all the other items that Fiesta has to offer. 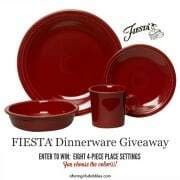 Fiesta Dinnerware is made in the USA, and microwave, dishwasher, and oven proof. Fiesta is available at www.homerlaughlin.com, better departments stores, specialty shops, and .coms. 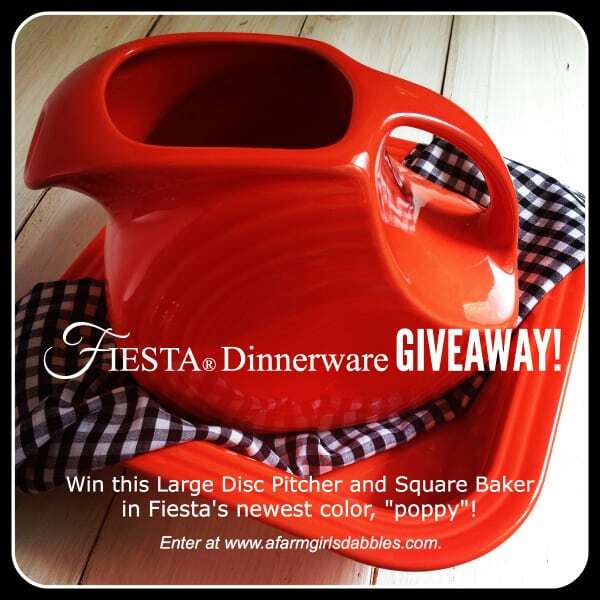 Disclosure: Fiesta Dinnerware, a brand that we use every single day in our home, sent me Fiesta pieces and provided the items for this giveaway. I was not compensated to write this post. All opinions are my own. Love the poppy and lemongrass! Lapis! Love it! Thank you! I love the “Lapis” & “Poppy” colors. So bright and beautiful. Thank you for the review and opportunity. They are all too pretty to choose! Think it’d be really cool to mix and match them – plum & lapis & shamrock or paprika, sunflower & ivory! I love the new poppy color, but I also love the Tangerine and the peacock colors. So hard to decide. Poppy!! So pretty! Thank you for the chance! First let me start off with I LOVE your blog! I am a HUGE fan! Second, i really like the “Paprika” color i think? It is between that and the Scarlet color….. but man what an awesome line of products! Thanks for sharing! Love all of the “Fiesta of Colors”. The cobalt blue is one of my favorites. Love the new Poppy color, too. I’m having a hard time deciding between poppy, scarlet and paprika, they are all very nice colors. I have collected the various colors of dinnerware for several years now. The bright colors are my favorites; lemongrass, turquoise, and poppy! I would like Tangerine, please and thank you. Cobalt Blue – gorgeous! 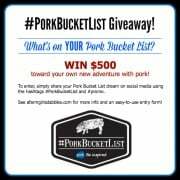 Thanks for the opportunity to enter & win! For sure-The new Poppy color! Lapis best, though there are several in my personal color schemes. I have a few of the colors, I love Fiesta dinnerware. I really like the new poppy color and lemongrass is a unique color that I don’t have either. I love the Poppy color–so cute and bright! It’s a toss up between plum and lemongrass! Hmm, I thought my favorite would be the plum, but I love the paprika. Red with a bit of brown. Very earthy but still colorful. hard choice! I think Peacock….thanks for the chance to win! I love so many of them, but if I had to choose just one, I’d probably go with sunflower. I love the Plum color best. But it is a toss up with Lemongrass. my fave is the turquoise! Sunflower is such a happy color. Wow – hard to have a favorite. Like the Shamrock best, I think. My favorite is the plum! My brother has a set of fiesta plates that are yellow with smiley faces on them- they’re so cute! I have tried about 20 times to make the widget work for 2 days now and it won’t let me go by the first one…. I’ve also made the reports that it’s not working!! I am so sorry to hear this, Linda. Have you tried using a different web browser? Sometimes that does the trick. Today, poppy is my favorite! I love the new poppy! I would love to start a collection with ivory and lemongrass. Like them all, but since I must choose one, I choose scarlet. My second choice would be tangerine. I love Fiestaware! Tangerine is one of my favorites, but I really like the new poppy! LOVE Fiestaware!! And Lapis is my color! OH MY !!!!!!!!! POPPY PLEASE…..
With Fiesta ware, I love the look of a mix of their beautiful colors, but if I had to choose just one, I think I’d have to go with the Peacock. Oh the plum and shamrock are beautiful. I like the scarlet color the best. I like the Plum color. I would love to have this in Poppy. Shamrock is my favorite but it is fun to mix-and-match. I love the poppy! What a great cor! I love the Shamrock color ! Poppy is the best — it is a great accent color in my home! I love the Poppy color – perfect for all the upcoming holidays! I love Sunflower but would go for Paprika too. Turquoise! Poppy is a close second. Scarlet is still my all time fav hands down! I love the poppy color! Perfect for Fall parties! I LOVE the new poppy color, but I think Peacock is my favorite. Would so make my new kitchen!! Lemongrass or Peacock blue I can’t choose! LOVE my fiestaware! My favorite color is Paprika. Cobalt blue is my favorite! Matches my kitchen sink. Love the POPPY! It makes me smile! I love the plum color – but the poppy and turquoise are gorgeous too! I like the new color, Poppy. Love all the colors! Especially the scarlet and paprika. I love the poppy. And the turquoise. They’re all beautiful. I LOVE the red! They have amazing stuff! I have wanted Fiesta dinnerware for years & I love the new color. I really like flamingo because it’s a fun color but not too dark. All my dishes are cobalt and turquoise. I love Fiesta! They are all amazing. Imagine having a kitchen with a mix of all of the colors. My favorite is scarlet. My favorite is the Scarlet but Poppy is lovely. I also love the Cobalt Blue. My kitchen is brown with pops of red, so I’m in love with the poppy!! I just love Fiesta. I like to mix colors. If I had to pick a favorite, it’s Paprika. My favorite is flamingo because it reminds me of my Mom. She owned original Fiesta. Loved it. I like to mix and match, but I do love a pop of Marigold. um all of them? =) Turquoise or the orange! Love the lapis and marigold! I love them all but I would say lapis is a favorite. I like all the colors but I think the poppy is my favorite! Poppy. Red has always been my favorite color. Too many to choose just one! I love to mix & match. Shamrock, Paprika, Sunflower & Poppy would all look great in my kitchen. I love a lot of them! I currently have a variety of colors…my sister found a bunch at Goodwill for me super cheap and in great shape! To pick a favorite though, I might have to go with peacock. Hard to choose though! My favorite color is the Shamrock. I love Fiestaware. I registered for it as my everyday china for my wedding several years ago. I have the basic colors of the rainbow, with cobalt being my favorite. Of the colors since though, I think that poppy takes the cake! That is such an awesome color! My favorite color is scarlet. Sunflower is my favorite color. Poppy followed closely by turquoise. Love them all but really like the plum! I love the plum color! My favorites are poppy and turquoise. I like the lemongrass the best. I would have a hard time choosing between the marigold and the lemongrass. I love the cobalt blue color from Fiesta! So many pretty colors, so hard to choose just one! What a wide array of colors. I love love the Cobalt Blue and the poppy colors the most. It’s a very close race between Poppy and Tangerine. My all time fave was a pattern they had years ago, a slice of kiwi on a green plate. My sister’s last name is pronounced Key-Weez so I tried to convince her to buy them. Still mad she didn’t! I like the plum color the most. It is so pretty – would be lovely for fall! i really like the blue but it would be a neat set to mix up the colors! I love the cobalt blue. I’ve never seen it before! My favorite is a toss-up between tangerine and turquoise! I really love all the colors, they are all so beautiful and vibrant. For my kitchen the Scarlet or Black works the best. RED!!!! It feels like classic Fiesta Dinnerwear to me! The poppy would fit well in my house! I love the sunflower! But they’re all beautiful! I’m loving this poppy color. Perfect for fall! Love solid color dishes like Fiesta. Food always looks sharp without competing with guady flowers or designs. Striking colors are my favorite! Love the antique Feista too. My mom and grandma have given me some and it is timeless! I hear you loud and clear, love the solid colors! I have to say, the Poppy is pretty poppy! I have always pictured a farmhouse kitchen with a table set in Fiesta Sunflower !!!! I just love that Sunflower color, have been adding more side pieces in it. LOVE! I like the Turquoise color, very pretty. We have a collection of the marigold and paprika, but I’d love to add in the cobalt or peacock. I love turquoise, but I also love the beautiful green that’s been discontinued (from the 40s?). I love the Lapis color the best. Thank you for the wonderful giveaway. It’s a tie between Shamrock and turquoise! I love both! I always seem to choose the blues – cobalt, turquoise and lapis – or plum, but I’d love to have any of the colors. It’s amazing to see how different Fiesta ware is these days. My mother-in-law had an olive green set with brown accents from the 1950s-’60s. My, how things have changed! Love the scarlet and the plum, but all the blues call my name too! I LOVE the newest color poppy! I’d love a mix of colors, but I really like the lapis and poppy! Oh, and also the plum! Definitely poppy. Very cool. Thanks for a great giveaway. Scarlet is my favorite color. Paprika and turquoise are lovely. I like the Cobalt blue. I love the lapis ones. I love the flamingo, it is such a pretty color and would cheer up many a meal. I love the poppy, peacock, and sunflower colors! I have an assortment of colors and if a piece breaks I can easily replace it and not have to worry about matching a color. My current favorite is Lemongrass. I love the tangerine and poppy! 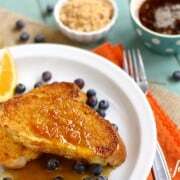 This looks so yummy, Brenda! I love the scarlet!! Thank you! I love many of their colors, especially the cobalt blue and the tangerine. I love the white! Classic! I like the Paprika the best although all the colors are nice. A nice giveaway. Thanks so much. I have a mixed collection of colors but LEMONGRASS looks really beautiful! Colbalt Blue and Poppy! Awesome! scarlet, it matches my kitchen walls! All things red so Poppy! Hard to choose, but I’d go with the Peacock. I love the Lapis but my favorite is the new Poppy! Lapis is beautiful! Grandma had a mixed set in the early 60’s. I thought it was WEIRD! NOW I wish I had hers! Red is my very Favorite color! I think I would choose scarlet. My husband has been wanting red dishes. I think I prefer the red, more vibrant! Count me in! The peacock is very nice……Thank you for the chance! Peacock is great in person. My fav for sure. I’d have a hard time choosing between plum and peacock. I love the Poppy as well. The poppy would look great on my black countertops! I love the poppy, too! My wife would probably prefer the red color! I love the paprika color!! I love the scarlet color. Would go great with my kitchen! Pretty colors, but my favorite is turquoise. I’ve always loved the Turquoise, but this Poppy might be a new favorite! I have almost all of the current colors but am missing Poppy now! The poppy color is beautiful! I have a bunch of colors already but really love marigold and poppy!